I never get tired of coaching Prepper Newbies. Friend, relatives and strangers; it makes no matter. I talk about family preparedness where ever I go to anyone who will listen. It is not that I want to get preachy (well maybe just a little), but that by implementing a few basic steps, a person can become better prepared than 90% of his or her neighbors. The way I see it, the more people that prepare – even with just the basics – the greater the likelihood that we all will recover unscathed from a short term disruptive event. If I may take a tangent here, do you like that word? Disruptive Event? That is my catch-all for the myriad of things that could happen to turn our lives upside down. From natural disasters, to pandemics, to political upheaval, to economic collapse, the more folks that are prepared for even the short term, the less likely there will be desperate, tired, and hungry people knocking on our doors for assistance. Today, Backdoor Survival Contributing Author Rob Hanus is back with 10 simple steps get a jump start on preparedness. Read them and share them. And by the way, there is probably a tip or two here that the more experienced prepper may have missed. For those of you that are new to preparedness, this quick start guide will help you accomplish some of the basics that every preparedness plan needs. Those of you that have been preparing for a while, you might want to forward this along to those people you know that might consider preparing at a basic level. Think of this as Family Insurance. This Family Insurance is what you can count on in a crisis, disaster or emergency. It’s there, just as any other insurance, when you need it, so you can continue to provide for your family. And best of all, there’s no paperwork to fill out and no regular monthly checks to write in order to be able to use it. This is preparedness at its most basic level. Being prepared to continue providing for your family is a good idea, as they will be looking to you for the answers in times of crisis. Make it a goal to accomplish these 10 basic things that will put you far above others when an unexpected event happens. Come up with a solution for each of the following with the understanding that you can’t just go stay with a relative across town. 2. Find a solution to cook without electricity or your stove. 3. Have bottled water for a week’s worth of drinking and a solution to obtain clean water when the tap water stops flowing and the stores are closed. 4. Find a solution to keep warm/cool when the power is out. 5. Find a solution for light when there is no power. 6. Have a way to use the rest room, even when there is no water pressure. 7. Have a plan in case you need to leave your home, fire, etc. 8. Find solution to add to your security, in case someone tries to break in. 9. Make sure you have copies of important documentation that is easy to grab or stored off site, including back ups for your computer. 10. As these are only the basics, make a list of prep tasks that increases your preparedness beyond the basics that you can chip away at. For an expansion on these solutions, check out my book, The Preparedness Capability Checklist. Did you notice that none of these tips are telling you what to do exactly? That is because one size definitely does not fit all when it comes to preparedness. What you want to do is seek solutions that work for you and your family. Where you live, family size, age, health, and personal financial considerations will dictate the solution that is right for you. It is easy, in my opinion, to become bogged down in a preparedness strategy full of complicated details. Perhaps that is why I frequently post information in a list format. Call them checklists, punch lists, or simply bullet points, it really does not matter. Lists break down concepts into simple, actionable ideas and activities, making it easy to get something done without feeling overwhelmed. Whether you are just getting started or an old hand at prepping, take a look again at #10. Why not take a few moments to start a list of prep tasks that you can gradually chip away at, knowing that you already have the basics covered? Bargain Bin: Here are some items that match up to the 10 tips that Jump Start Your Path to Preparedness. Mountain House 72 Hour Emergency Meal Kit “Just In Case” Meal Kit: One of the best ways to stock up on food is to pick up a few extra cans of this or that on your regular shopping trip. That said, you can also purchase freeze–dried foods to supplement your pantry. Some of my favorites are from Mountain House, and especially the Mountain House Chili Mac. Solo Stove: I personally own four solo stoves including the large Solo Stove Campfire. They are compact yet well-built and perfect for cooking off-grid with just a bit of biomass. They come in varying sizes so you can choose the one that is right for you. LifeStraw Family 1.0 Water Purifier: The Lifestraw Family contains no chemicals, no batteries and no moving parts to wear out. It features a a high flow rate and is the perfect solution to your portable water purification needs – whether bugging in or bugging out. As of this writing, shipping is free. We place one of these blankets silver side up on our mattress underneath the fitted sheet or mattress cover. It reflects body heat like you wouldn’t believe, instead of the heat being absorbed into the mattress. 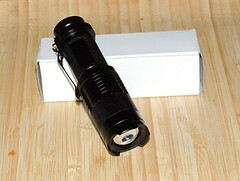 Emergency Flashlights: There are many choices when it comes to flashlights. I prefer to have a lot of small flashlights stashed all over the place. My favorites are the uber-cheap Mini Cree and the Blocklite. I also have built a total of five 2000-hour flashlights using this Eveready Lantern as a base. Tote-able Toilet:. I have priced purchasing the bucket and toilet seat lid separately and found that it was more economical to pick up this kit. 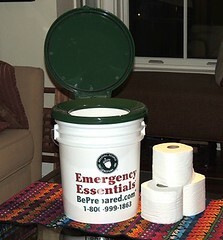 I have filled my portable potty with sanitation supplies plus, of course, plenty of TP. 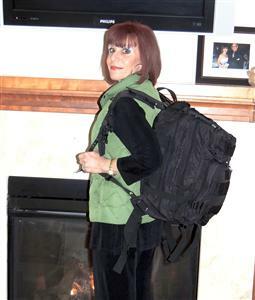 Rothco Medium Transport Pack: What I really like about these Rothco packs is the narrow profile. As you can see in the picture, it is only as wide as my body. Sure, it sticks out a bit in back but at least I do not bump in to things. There are lots of compartments and pouches and it by far, the most comfortable pack I have ever worn. I actually own 3 Rothco packs, 2 in the medium size and one large. I keep one pack permanently in my vehicle. Dorcy LED Wireless Motion Sensor Flood Lite: Don’t let the $20 price lead you to think this wireless flood light is wimpy. I have two of these and feel that these lights are worth double the price. Using D-cell batteries, the Dorcy floodlight will light up a dark room or a dark stairway in an instant. I can not recommend these enough. Also see Personal Defense Equipment from Amazon. Silicon Power 8GB Flash Drive, Gray Aluminum: I just purchased this flash drive for my key ring because the one I purchased a couple of years ago broke. The flash drive itself works but the key ring thing made of plastic broke off. This flash drive has a ring shaped metallic exterior which should stand up over time. Plus, it is less than $6 with free shipping. List of Things To Do: Pen, paper and a bit of motivation is all you need. The price is nothing more than your time. 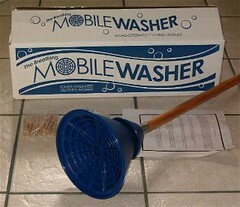 I love my Mobile Washer. This is hand operated washing machine. Like a plunger, it uses a technique of pushing and pulling the water through clothes to clean them well without wearing them out. It uses a minimum of water and less soap due to the agitation motion. Use in a bucket (5-gallon suggested), sink or tub. The best part is the price – only $14.95. I have driven the 35 miles to town planning on getting one specific item, then when I got back home and brought everything else in, realized that I didn’t get that one item that I went to town to get! By luck it was not anything life threatening, and the next time I went in to town (two or three days later) I made sure I got it! But it does make you feel a bit stupid. We are on the mainland north of Bellingham. What are your predictions regarding the flow of natural gas if we have a catastrophic event? I am thinking about heat and cooking alternatives? I have a freestanding natural gas fired stove as an alternative to forced air heating, but with no supply, perhaps I should consider purchasing a wood fired stove as a backup for cooking and heat? Since reading your messages I have been methodically purchasing supplies and preparing an organized storage area. Right now my focus is on water filtration. I am within walking distance of the Nooksack River. See, some of us actually take your advice to heart. NG. However, I did read an article a few weeks ago about the effects on NG in case of an EMP. It seems that the gas companies use computer controlls to regulate the pressure in the lines, which varies according to usage. The more NG is used, for heating, cooking, etc., the more the pressure tends to drop. The computers allow more gas into the system to maintain pressure. In the event of an EMP the computers may be destroyed, as well as the flow control valves (which are electrical). If I recall correctly the article said that you would still have gas, but that the pressure may have great fluctuations, being lower during peak usage and higher at other times. So, it would be better to keep an eye on how well your gas flame is burning and either open the controlled knob more or less to regulate it.